The same article quotes a Chinese government official who responded, accurately, by calling the arms sale “… a gross intervention intoChina’s internal affairs, [and] seriously endanger[ing] China’s national security…” In 1962, When Russia supplied missiles to Cuba, nearFlorida’s coast, the U.S. interpreted this to be an act of war. Obama’s polices against China have been far more aggressive than Bush’s, making a farce out of his campaign promises of a more peaceful foreign policy. Obama’s same, deceitful approach is used inSouth America, where he promised “non-intervention” and then proceeded to build military bases in Colombia on Venezuela’s border, while giving a green light to the coup in Honduras. 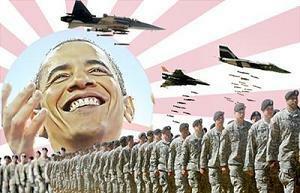 U.S. Military Out of the Middle East!